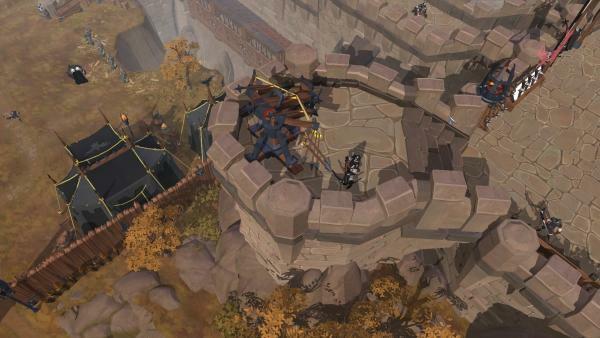 Albion Online is an isometric visual MMORPG set in a medieval fantasy world. Here the player can be what he wants: magician, archer, miner, carpenter, artisan, merchant. No roads are blocked. The game features a completely free structure or, as it is said of these times, sandbox. There is a clear appeal to famous exponents of the genre, such as Ultima Online and Runescape. Certainly, the title goes a long way in suggesting a slow and difficult experience, which will surely appeal to all those players who are looking for a product that does not keep you in hand all the time. There are no default classes in Albion Online. The powers and abilities of each PG depend on the weapon and armor worn, as summarized by the motto "You are what you wear". So, for example, with the right equipment, you can change your role from damage dealer to tank in just a few clicks. The Destiny Board is a screen that is used to track the progress of our avatars. As the Ultima Online teaches, even in Albion it does not count on levels but skills: the more we spread the stone and the better we do it, the more we kill enemies with the bow, and so on. In total, there are seven tiers of progression that relate to any resource, object, or weapon in the world: a T1 ax is a primitive, almost primitive tool, while a T7 ax is a powerful artifact that can only be used by more experienced hands . Since tier climbs takes time and effort, you should understand as soon as possible what you want to devote and concentrate on that. In Albion Online you have to grind, and not least. We are not at the level of a Lineage, but in fact to get into the various skills we are interested in, we will be forced to repeat the same actions. Everyone can dedicate to grinding the time they want, but it is undeniable that those who close to grind 24/7 will grow faster than others. The positive thing is that there is always a sense of progression: it is always the impression that your PG is growing, albeit slowly, and this is clearly reflected in our powers as well as in the interaction with the surrounding environment. Harvesting and crafting systems are quite simple, far from the complexity of a Star Wars Galaxies, but virtually every object in the world is created by players, and the durability and death penalty system prevents the stagnation of the economy; Albion Online will never create a situation where crafter work is not required as players already have their highest-quality non-removable objects. Instead, everything consumes and breaks, forcing a continuous flow of spare. The combat system, on the other hand, is rather sloppy. Not that it is horrible, for charity, but it is static and slow. Of course, playing in PvP all speeds up, but the fact remains that Albion's combat system is not surprising or hurting, or rather paralyzed, if compared to other exponents of the genre.